The Roaring Twenties was a great era. 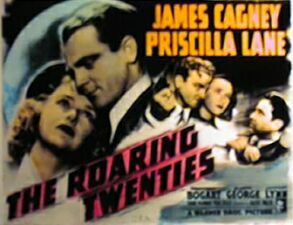 It was bootleg time, and speakeasies were opening up. People used to make all kinds of liquor and beer, buy bootleg alcohol, and make their own whiskey. 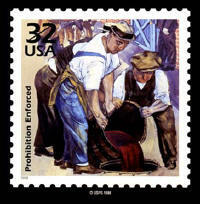 Occasionally you would see federal revenue agents nabbing bootleggers delivering their alcohol. I often saw this on 14th Avenue where I had my little gas station. Bootleggers would distill the mash and other things to make pure alcohol, which was about 160 to 170 proof. It was sold almost immediately after it was made. Almost every block or two where I lived had somebody selling alcohol. My mom and dad use to buy the distilled alcohol in five-gallon cans for about $2 a gallon. A five-gallon can would run about $10 or more. It all depended on the taste of the alcohol. They would buy the distilled alcohol to make their own whiskey. They would buy anisette, or little bottles of whiskey that you could mix with the alcohol in order to make a certain proof. We didn't want to drink straight alcohol. We wanted something about 80 or 90 proof. The Anisette we wanted about 60 or 70 proof. My family would also make Stragal cordial for the holidays. They would buy large cherries and preserves and soak them in fresh alcohol or whiskey for about six months or a year. These were especially good in the winter season. When I worked in a garage on Orange Street near 15th or 16th Street, there was a deluxe speakeasy close by in the rear of a garage. It was known only to the elite people in town. In order to be a member you had to know someone in the speakeasy, the manager or the boss. They would issue you an admittance card with your name and who you were, and then you were allowed in. It was just like in the old movies. The speakeasy had a small peephole in the door. A guard would look out the peephole and you would pass your card to him so he could see if it was authentic, and then he would allow you to enter. I had a card issued to me because I was previously admitted with a bonafide member of long standing. One night I treated my dad to this place. He was admitted as a guest with my card, and he was amazed at what the speakeasy looked like inside. It had a large bar with many people standing around. The interior was decorated very nicely, with lots of tables and chairs, sort of like a nightclub. There were pictures on the wall of famous singers and actresses. My dad wanted to know how this whole place came about. I explained that people selling alcohol were secreted from the police, even though there were many city officials there. We had a couple of drinks and left. He was happy to see it. The repeal of Prohibition in the early 1930's was a godsend. FDR restored the making of beer as his first gesture on becoming president. Legalizing the production of alcohol helped put thousands of people back to work. Many breweries were reopened, which meant that many of the old-time brewers were coming back to make beer, malt, and hops. It also created a market for kegs, delivery trucks, warehouses for storing the liquor, and tavern's for selling it. The repeal of Prohibition helped the economy very much. It stimulated the economy and improved the unemployment situation. Many people noticed the difference. Formerly unemployed people were now working and spending money for long-needed things, and enjoying life a lot more than before. All told, it was the best thing for everyone.